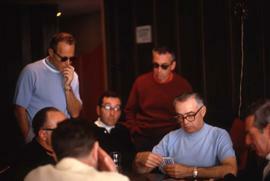 Colour Kodachrome 35mm slide depicts a group of unknown men sitting around a table playing cards. 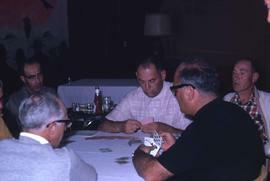 Colour Kodachrome 35mm slide depicts a group of unknown men sitting an standing around a table playing cards. Colour Kodachrome 35mm slide depicts a group of unknown men sitting around a table having a discussion and there are several glasses of what appears to be beer on the table. Colour Kodachrome 35mm slide depicts a group of unknown men sitting around a table that has food on it and the man in the foreground is out of focus. Colour Kodachrome 35mm slide depicts a group of unknown people sitting at long tables. The tables have many plates and cups on them and several of the people are holding cigarettes. Colour Kodachrome 35mm slide depicts a group of unknown people sitting on an unseen object with the unknown man and woman in the centre are smiling at the camera and the man is holding a pipe. Colour Kodachrome 35mm slide depicts a group of unknown people smiling sitting on hay bales and there is an unknown man in a red shirt looking towards the left side of the image with his mouth wide open. Colour Kodachrome 35mm slide depicts a group of unknown people with two women, one of whom is wearing a pink dress and a white belt, in the centre speaking with each other; likely at a golf course. Colour Kodachrome 35mm slide depicts a group of unknown people smiling at the camera while sitting on hay and one of the women in the back has her arm raised up. They are likely sitting on hay bales.